Sunday mornings have become our time to catch up on SNL - and make granola. I start prepping the batch as the show starts, and some time later, the granola is done, the house smells divine, and we've laughed enough to last the day. 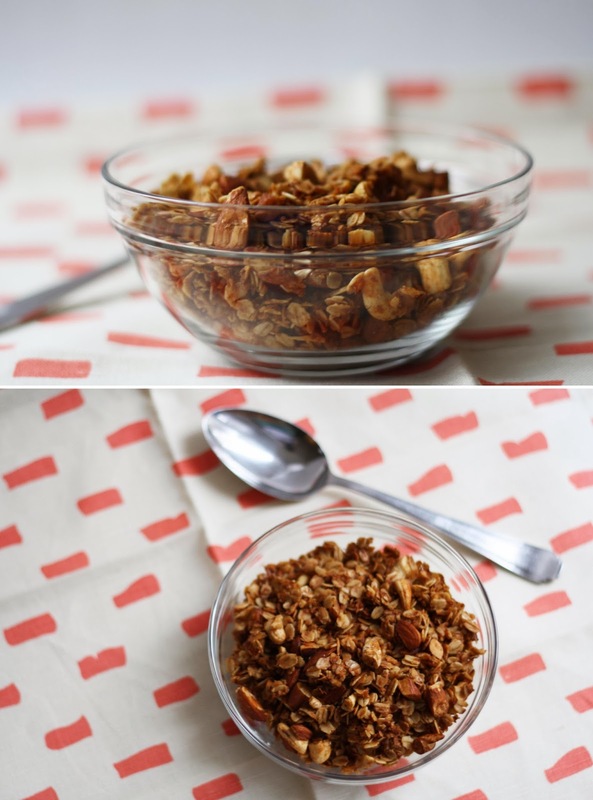 I came across this recipe for chai granola and was amazed at the simplicity of recreating a chai flavour. You're going to love it. In a large bowl, combined oats, chopped nuts, coconut and spices. In a separate bowl, melt the coconut oil, and then whisk in the honey and vanilla. Pour the liquid over the oats and mix well, making sure to coat all the oats with the oil/honey mixture. Place the mixture on a parchment lined baking sheet and bake for 20-25 minutes, checking and stirring at 10.